Cheryl Logan, Ed.D., superintendent of Omaha Public Schools, chats with High School Alliance students. 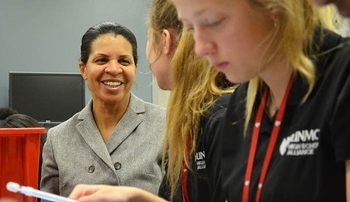 Cheryl Logan, Ed.D., superintendent of Omaha Public Schools, recently visited UNMC in order to learn more about the High School Alliance program. The UNMC High School Alliance immerses highly motivated high school students from varying educational and socioeconomic backgrounds into an environment which will introduce them to health professions, leading to a more diverse Nebraska workforce. The program provides high school juniors and seniors with the opportunity to observe, shadow and work alongside health care professionals and researchers at UNMC. "It was very interesting to watch," Dr. Logan said. "The kids know they need to work in groups and teams. And I know from other visits here that that is a huge part of the culture here at UNMC. It is really interesting how that is very evident in this high school program. "For me, as a culture person, that's how you really have done well in embedding your culture, when in every program, or everything that you do, you can see it. An outsider can come in and make that observation." Dr. Logan relished the chance to interact with these students -- something she says is one of her favorite parts of her job, but one she does not get to do as often as she would like. OPS is a significant partner for the UNMC High School Alliance. OPS provides the alliance's certified high school science teachers, and OPS students make up a plurality of the 65 alliance students from 26 schools and 15 public school districts in the greater Omaha area. Dr. Logan was very impressed with what the program. "It's fantastic," she said.